4.5 stars - so close to a 5.Stephanie Perkins, you just made it to my favorite authors list. I wanted to put you there before, but I thought there was a chance that the brilliance of Anna and the French Kiss might have been a fluke. Now that I've read Lola, I know things are still good between us. I don't have to sever the ties or try to breakup with you in a nice way that won't hurt your feelings. 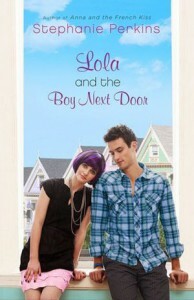 Lola and the Boy Next Door was such a fun book. This author's style is different, fresh and tongue-in-cheek. It's hard not to enjoy reading about quirky characters in quirky situations. I have yet to find someone who doesn't like this author after trying her, and if I did, I'm not sure how I'd respond to that. You mean you want to read another story just like the last twenty you read? Okay, have fun with that.Huge thumbs up for the San Francisco and Berkeley locations. Yay for an area of the country that's a familiar old love of mine. This is a good place to follow up the epic setting of Paris from the last book.Cricket and Lola were no Anna and St. Clair, and surprisingly, this was okay! I didn't think anyone could top Anna and her Etienne, but Cricket and Lola had their own swagger. I loved Cricket's offbeat way of thinking, dressing, and interacting with others. He wasn't the same charmer that St. Clair was, but I found myself charmed nonetheless. If you don't believe this is possible, come back after reading the whole scene explaining the stars on his hand (insert rather embarrassing fangirl swoon).If you haven't read this book or the predecessor Anna and the French Kiss, get on it. If you like quirky characters, fun stories with a heavy dash of offbeat humor, and adorable romances, you're missing out if you haven't read these books.